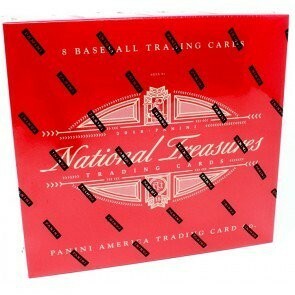 Configuration: 1 pack per box. 8 cards per pack. - Find new booklets featuring Legendary Lineups, Quad Signatures, Six Signatures, Franchise Lineups, New York Row, and a one of a kind Ruth and Gehrig dual signed cut booklet! - Look for LIVE Shohei Ohtani on-card autographs in Rookie Material Signatures, Player’s Collection Signatures, Rookie Triple Material Ink, Hometown Heroes, Rookie Signatures, Retro Signatures, Treasured Signatures, Rookie Signature Jumbo Material Booklet and NT Signature Booklet! - Rookie Materials Signatures features the most comprehensive on-card autographs of this year’s rookies including Shohei Ohtani, Ozzie Albies, Austin Hays, Amed Rosario, Miguel Andujar, Rhys Hoskins, Gleyber Torres, Juan Soto, Ronald Acuna Jr. and more! - Find new material including cleats, ID Tags from legends and Remarkable Rarities from baseball/history! - Look for new inserts including Game Gear, Colossal Rookie Materials, Hall of Fame Materials, Game Gear Signatures, Stars and Stripes Autographs, Signature Names, Century Materials, Hall of Fame Signatures, Century Materials Signatures and more! All great teams have one thing in common, an iconic core of players that struck fear in their opponent’s hearts. Legendary Lineups pays tribute to the cores of these all-time teams! Always a fan favorite, Rookie Material Signatures features on-card autographs from a full crop of top current and future stars! This booklet set features on-card autographs from the game’s top young players and all-time greats! In this set you’ll find on-card autographs combined with a swatch from some of the game’s best current and former players. Look for new memorabilia cards this year featuring cleats, bat barrel nameplates, and ID tags! Legendary players paired with legendary material. Century Materials features swatches from baseball’s royalty. Find on-card autographs of some of the game’s biggest current and future stars paired with jumbo swatches! Look for unique die-cuts and parallels.